Flash is Dead on Arrival. Was it Good or Bad? image/svg+xml image/svg+xml image/svg+xmlimage/svg+xmlimage/svg+xml Flash is Dead on Arrival. Was it Good or Bad?Flash is Dead on Arrival. Was it Good or Bad?Flash is Dead on Arrival. Was it Good or Bad?Flash is Dead on Arrival. Was it Good or Bad?Flash is Dead on Arrival. Was it Good or Bad?Flash is Dead on Arrival. Was it Good or Bad?Flash is Dead on Arrival. Was it Good or Bad?Flash is Dead on Arrival. Was it Good or Bad? It’s been more than a year after the unfortunate Flash Player update took place with its fatal security vulnerabilities. Adobe fixed them in 2 months, meaning that you were not safe playing Farmville on Facebook during that time. The modern market can’t rely on the technology that’s so unpredicted and potentially dangerous. July 12, 2015: Alex Stamosl from Facebook (@alexstamos) asks Adobe to announce the end-of-life date for Flash. Mozilla supports this initiative. July 13, 2015: iSpring releases a utility that fixes PowerPoint presentations corrupted by Flash. Users are instructed on how to downgrade Flash Player. September 23, 2015: Adobe seems to fix all the vulnerabilities. Long live Flash. Has anything happened since that time? Yes, something important inside Adobe as well as in the media. Adobe released a successor for Flash IDE called Animate CC for developers, and Adobe officials seemed to accept the word HTML5 in their vocabulary (according to Wired). It seems that Adobe now helps transitioning from Flash to HTML5 because it became more common and demanded and it’s powerful enough. More and more browsers are blocking Flash by default in favor of HTML5. By the end of 2016, Google Chrome is going to turn off the Flash Player plugin by default. Getting rid of Flash completely is a long process, and it’s partially self-organized with large companies and the developer community involved. The consumer world is changing along with the technologies, but Flash stays the same. It is not developing anymore; Adobe is merely closing gaps and security issues. The IT community constantly tears Flash apart and squeezes out the last drops of usefulness. What does this mean? In December, Chrome 55 will make HTML5 the default experience, except for sites that still don’t have an HTML5 alternative for Flash activities. You will need to enable the Adobe Flash plugin for these sites when you visit them, like it’s done in Safari. Today, sites typically use technologies like HTML5, giving you improved security, reduced power consumption and faster page load times. Going forward, Chrome will de-emphasize Flash in favor of HTML5. Before that, in 2015, Mozilla Firefox blocked Flash permanently and then restored it after Adobe fixed it. This protected Firefox users from a vulnerability in Flash Player that cyber-thieves exploited to install malicious software and steal data. Chrome is trying to prevent such cases in future. Like a character in a zombie flick, Adobe Flash (formerly called Macromedia Flash and Shockwave Flash) is a software platform used for creating graphics, animation and rich internet applications that refuses to die. Despite a plethora of well-publicized security issues, it’s simply too useful and too much a part of current tech culture to go away. This is an expert point of view in an IT security magazine, where the author claims that despite all the facts and risks, Flash will be used for some time. The main question “For how long?” is still with no answer. Where is Flash still being used? Social network online games (e.g., on Facebook). E-Learning courses and interactions for desktops that haven’t been re-designed in HTML5. In-class training and sharing iSpring .swf courses over email. A course can be published as one file. Video-hosting services as a backup option for new HTML5 players (because it’s not supported by old Internet Explorer 8 and earlier). The programming language for Flash games and interactions in .swf is called ActionScript. The most recent version is 3.0, and all Facebook games that you know are created using this programming language and Adobe Professional CC development environment. A modern developer has to learn HTML5 (html, css, js), but there is no applicable development environment for creating graphics. Adobe offers a great IDE for creating vector graphics and animations called Animate CC (the successor to Flash CC). It makes possible to create characters for games and keyframe vector animations for HTML5 projects. Developers on Flash vs. HTML5 games on Facebook in 2015. If you use iSpring, you can create HTML5-driven animations in seconds. Just put them together in PowerPoint and publish to Flash. You will get an HTML page in the output folder that can be viewed in a browser. You don’t have to be a developer and learn ActionScript to create simple animations and publish them to web format. Even developers can use them as parts of their projects because iSpring offers the API to control published slides. Indeed, Apple sentenced Flash to death refusing to support it on iOS devices. Since Steve Jobs put Flash on the back burner in 2010, this technology has been fading away. As a result, there is no Flash on mobile devices, but its presence on desktops is still ubiquitous. This will come to end when all browsers block Flash by default. If you are using Safari on Mac, probably you are having problems with playing Flash content on the web. You need to turn it on manually in Safari settings. We at iSpring felt these vibes a long time ago and ported our main conversion framework from Flash to HTML5 in 2012. The first product was iSpring HTML5 Converter 1.0. It didn’t have 3d animation effects, but retained the major part of the PowerPoint animations. The modern-day converter does its job well and supports all 3d transition effects with the help of WebGL technology. There is close to no difference between Flash output and HTML5 output in iSpring. For the best compatibility, you can use the combined publishing mode, which turns your PowerPoint into a smart package that automatically detects the device and browser that you’re using. If an old desktop browser with no HTML5 support is used, it will show the Flash content. In all other cases, you will see the HTML5 presentation. If you are an e-Learning course designer and use iSpring, you shouldn’t worry about Flash output, because all iSpring authoring tools publish to HTML5 by default. iSpring still uses Flash technology in iSpring QuizMaker and other desktop products’ interfaces. 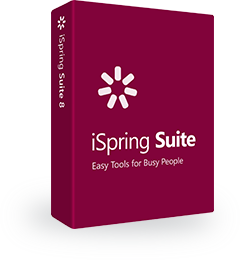 It won’t cause any compatibility issues for end users, because it’s on the authoring side, when you create e-Learning courses with iSpring. The only drawback of using Flash in interfaces is hi-res (or hidpi) displays. Some iSpring users complain that QuizMaker is hard to use because the texts are very small on retina displays (Windows on Mac or hi-res display on Windows). A temporary resolution will be setting the default (100% scale) and reducing the resolution. After that, the text might appear a little blurry because it’s not a natural resolution for your display, but all interfaces will look clear. iSpring is planning to get rid of all Flash interfaces by the end of 2017 in the next 9th version. When will Flash completely die? Nobody (<1%) uses IE8. Right now it’s still more popular than later versions. Convenient IDE for HTML5 development. We are almost there with Adobe Animate CC. All browsers block Flash Player plugin by default. Chrome is the most popular browser and it will block it by default by the end of 2016. Windows OS doesn’t include Flash Player as a system update. Installed on over 750 million computers, Flash Player enables organizations and individuals to build and deliver great digital experiences to their end users. Real-time dynamic effects with filters for Blur, DropShadow, Glow, Bevel, etc. This information was taken from the Adobe’s description for one of the latest Flash versions. There should be something good about it, especially for developers who can use the complete development environment with the convenient workflow. Sounds good, but still, no. It has always been a proprietary technology with security issues known only to Adobe, and even better known to cyber-thieves. It’s not good for all end users out there, which means that this technology will not be used as soon as people stop using older browsers without HTML5 support.